Laser Cataract Surgery vs Traditional | Sonny Goel, M.D. If you have been diagnosed with cataracts, surgery is the only way to permanently restore your vision and see clearly again. Dr. Sonny Goel can review the types of cataract surgery procedures with you at one of his Baltimore, MD-area locations. Dr. Goel is passionate about helping his patients see clearly. He emphasizes communication, and will thoroughly explain the traditional and laser-guided techniques of cataract surgery. Schedule your consultation today to learn more about the different types of cataract surgery. Traditional techniques for cataract surgery can be categorized as intracapulsar and extracapulsar. Intracapsular cataract extraction (ICCE) is a procedure type that was developed in the early 1980s. It involved the removal of the natural lens and capsule, a membrane that holds the lens in place. This procedure type is rarely performed today. Phacoemulsification: This is the most common type of cataract surgery. It is usually an outpatient procedure, performed under local anesthesia, and typically completed in less than one hour. The first step of the procedure consists of making small incisions on the side of the cornea. Dr. Goel then uses ultrasound vibrations to break up the cataract into small pieces. The pieces are then suctioned from your eye and replaced with an IOL. Standard Extracapsular Cataract Extraction (ECCE): This procedure is similar to phacoemulsification, but instead of emulsifying the cloudy lens, a larger incision is made on the side of the cornea, and the lens is removed in one piece. The IOL is then placed behind the iris, and the incision in the lens capsule is closed. While traditional surgery performed with a blade has helped millions of patients safely achieve clear vision, laser cataract surgery can result in greater accuracy in making the incision, and expedited recovery. 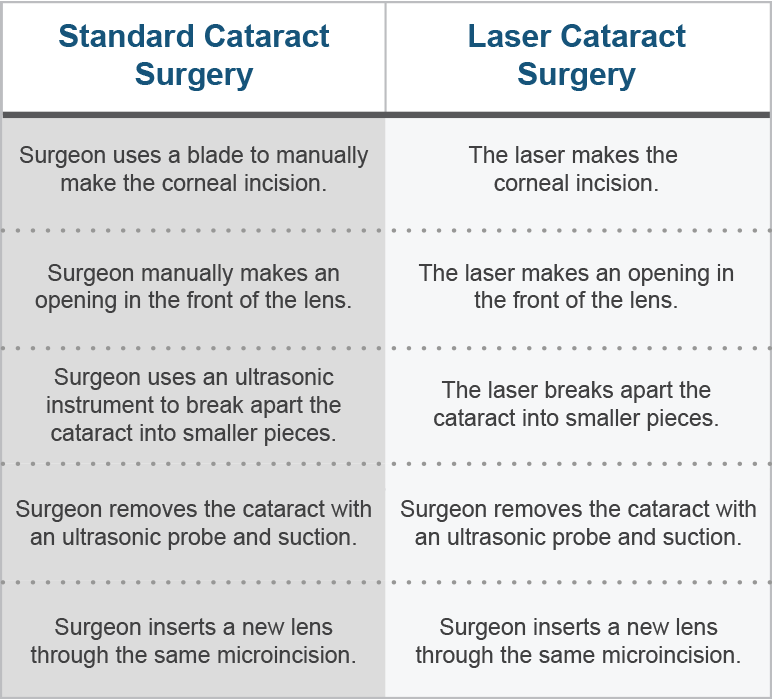 With all-laser cataract surgery, the first few steps vary when compared to traditional methods. During an all-laser procedure, the laser makes the corneal incision, creates the opening in the front of the lens, and breaks the cataract into smaller pieces. During traditional surgery, the surgeon completes these initial steps with a blade and ultrasonic instrument. All-laser cataract surgery can provide important benefits over traditional methods. Laser cataract surgery consistently results in minimal irritation, inflammation, discomfort, and complications, and reduced recovery times. The carefully calibrated lasers make the procedure safer and more efficient. Lastly, IOLs can help reduce or eliminate the need to wear corrective glasses or lenses. Dr. Goel will suggest the right type of IOL to help you achieve crisp, clear vision at a range of distances. If cataracts have blurred your vision and made it difficult to see clearly, Dr. Goel is an experienced surgeon who can help restore your vision through cataract surgery. To learn more about the types of cataract surgery performed at his Baltimore-area practice, schedule your consultation today.